While waiting for my coffee, I perused the other sweets on offer at Gemelli, a self-described “dessert cafe”. And though the regular suspects were all there – cannoli, panna cotta, biscotti, etc. – what dominated my attention was the Torta Tenerina. 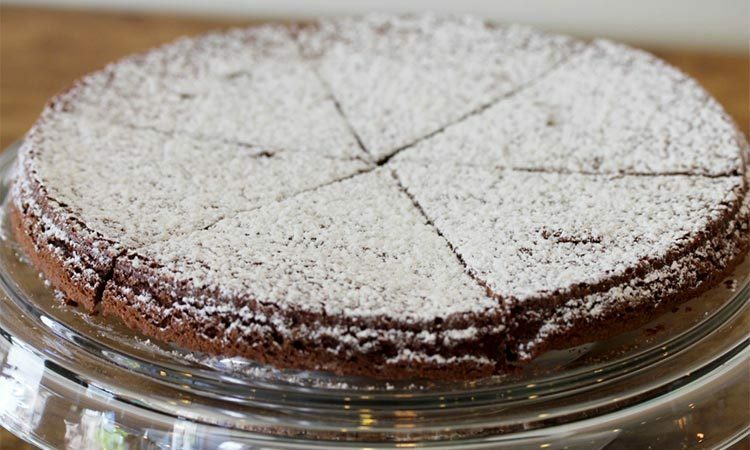 A thin chocolate cake dusted with powdered sugar, it was noted as being a specialty of Vincenzo’s hometown (the baker, I presumed). After slugging my espresso, I procured a piece to go, taking care to keep its mascarpone drizzle cool until I could enjoy it later. Truth be told, with regards to birthday-style cakes, I’m not a fan. Too sweet. Too airy. But Torta Tenerina isn’t like that at all. Perhaps closer to a brownie — if one had to find a comparison — the texture is unique. Literally “tender cake,” it somehow manages to taste rich and chocolatey while remaining soft and light. That said, Tettamanti’s philosophy is expansive enough to apply broadly. “In America, pizza and ice cream are junk food,” he says. “In Italy, that’s not the case. For pizza, as an example, there’s fresh mozzarella, dough that’s been rising all day so it is light and airy, and tomato sauce. That’s it. It’s a good meal. The gelato certainly is delicious. Tettamanti’s training and focus on quality above novelty shine through with every flavor. Even as one who tends to stick to the cioccolato, I can’t help but be tempted by the freshness of local goat cheese & raspberry or ricotta & fig varieties, for example. The cake’s initial incarnation (under the name Torta Montenegrina) celebrated Elena Petrović, Princess of Montenegro, shortly after her fin-de-siècle wedding to Italian king Vittorio Emanuele III. While many of the queen’s new subjects referred to her as the “sweet wife with the tender heart,” the Ferrarese one-upped everyone else by producing a dessert to match. Languidly soft with a melty interior, some still call it Torta Tacolenta — “sticky cake” in the Ferrarese dialect — due to its proclivity to cling to lucky tasters’ palates. My initial attempt at replicating Tettamanti’s technique was not particularly successful. Delicious, yes, but also dry and crumbly. I then made a few modifications to a common online recipe to get a moister, more flavorful version. In place of mascarpone cream, I served it alongside salted caramel gelato. Melt chocolate and butter together, over very low heat or a double-boiler. Take off heat and mix in EVOO. Beat egg yolks with sugar, then mix that with the chocolate. Put into a springform pan and bake for 25 minutes, and it’s done. A sprinkle of powdered sugar adds visual appeal but isn’t necessary.